From this day forward Amazon will no longer be known as the giant online retailer that also makes tablets and Kindles, but also as a company that makes smartphones. 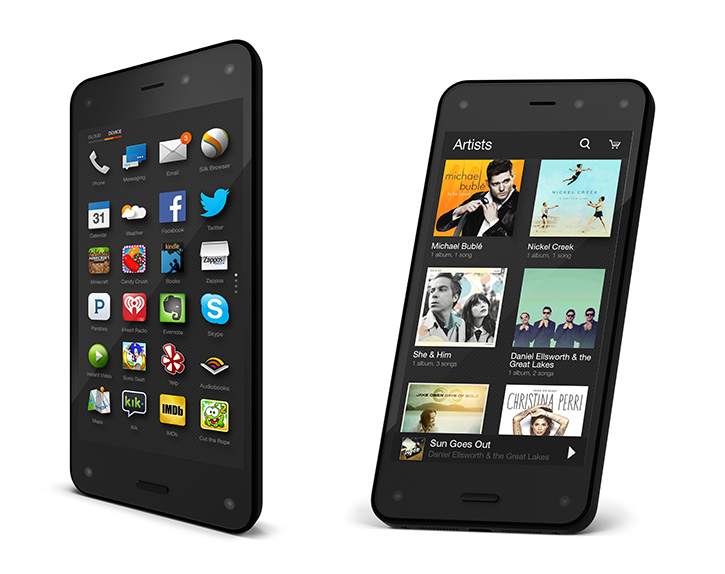 That’s right, Amazon has revealed its new smartphone, the Fire Phone. It’s Amazon’s first and only flagship smartphone to be designed by the company itself using materials like a rubberized frame, stainless steel reinforcement and aluminum buttons. Oh, and it only comes in black. 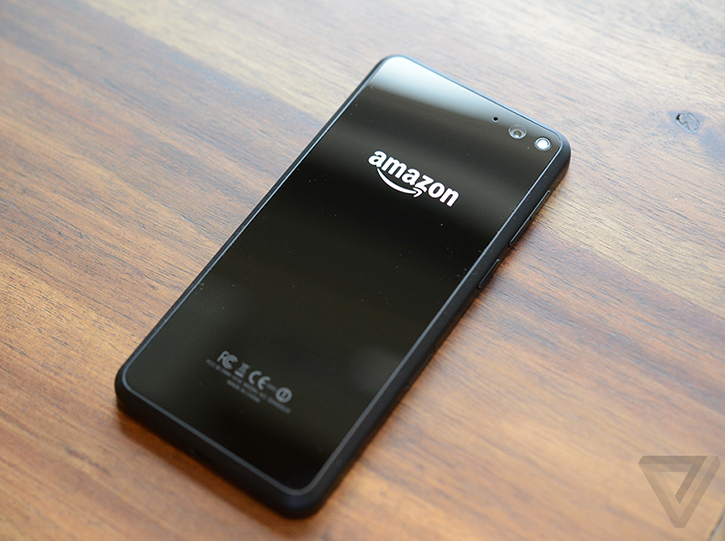 Unfortunately for Amazon's little design boasting, the Fire Phone looks like an entry-level, basic smartphone instead of a premium flagship device. The Fire Phone is 0.35-inches thick (compared to the 0.30-inch iPhone 5s and 0.34-inch Nexus 5), primarily made from plastic and is unexpectedly expensive, albeit isn’t lacking when it comes to features and specs. Prices start at $200 for a 32GB Fire Phone with a two year contract on AT&T, or $650 unlocked. The Fire Phone features an ultra-bright, Gorilla Glass 3-protected 4.7-inch IPS LCD HD display with the resolution of 1280x720 (315ppi), which Amazon says is the right size for one-handed use. A Gorilla Glass 3 panel can also be found covering the back of the Fire Phone which is surrounded by a rubberized plastic frame similar to the Nexus 4. Inside, Amazon's Fire Phone is equipped with a quad-core 2.2GHz Snapdragon 800 processor, 2GB of RAM, and an Adreno 330 graphics processor. There's a 2.1-megapixel front-facing camera as well as a 13-megapixel rear-facing auto focusing camera with LED flash, optical image stabilization with an f/2.0 5-element lens that is capable of recording full 1080p HD video, and supposedly cleaner low-light images than the iPhone 5s. Other features include dual bottom-firing stereo speakers with Dolby Digital Plus enhancement, Global LTE, Wi-Fi 802.11a/b/g/n/ac, Bluetooth 3.0 (does not support Bluetooth 4.0 Low Energy devices), NFC, and more. Amazon is also including a tangle-free stereo headset similar to Apple's EarPods in terms of ergonomics. Fire Phone puts everything you love about Amazon in the palm of your hand—instant access to Amazon’s vast content ecosystem and exclusive features like the Mayday button, ASAP, Second Screen, X-Ray, free unlimited photo storage, and more,” said Jeff Bezos, Amazon.com Founder and CEO. “The Firefly button lets you identify printed web and email addresses, phone numbers, QR and bar codes, artwork, and over 100 million items, including songs, movies, TV shows, and products—and take action in seconds. We invented a new sensor system called Dynamic Perspective that recognizes where a user’s head is relative to the device—we use it to offer customers a more immersive experience, one-handed navigation, and gestures that actually work. And this is only the beginning—the most powerful inventions are the ones that empower others to unleash their creativity—that’s why today we are launching the Dynamic Perspective SDK and the Firefly SDK—we can’t wait to see how developers surprise us. In addition two its standard front and back facing cameras, the Fire Phone also has four additional small front-facing cameras located at each corner which serves as a dynamic low-power camera tracking system for a feature Amazon is calling "Dynamic Prospective". Much like Apple's parallax motion effect, Amazon's Dynamic Prospective is the highly rumored 3D-like interface that actively tracks the user's face in any lighting condition providing a changing 3D viewing prospective around objects as you tilt the device. And in certain games, these cameras will be able to use your head movements to interact with a character's viewpoint in the game. Another feature that uses these four corner camera sensors is a new feature called "Firefly". It's an Amazon staple if you will, allowing the Fire Phone to scan and instantly identify literally anything with a press of a button. It can listen to audio, scan URLs, phone numbers, business cards, barcodes, QR codes and recognize items like games and household products giving you detailed information all without having to manually type them in while also enabling you to makes purchases of a particular product directly from Amazon. Like Amazon's Kindle Fire tablets, the Fire Phone is running a heavily skinned version of Android with Amazon's customized Fire OS 3.5. So naturally you'll be getting many Kindle Fire features including Amazon's free instant 24/7 Mayday service with live on-screen video representative device support, X-Ray, and of course Amazon's app, music, video and shopping ecosystem built right in. To sweeten the deal, Amazon is also including a free year of Amazon Prime (for a limited time) to new and existing customers who purchase a Fire Phone as well as unlimited Amazon Cloud Drive storage to store all of your 13-megapixel photos.